Israeli Prime Minister Ehud Olmert and Palestinian President Mahmoud Abbas held a “summit” meeting in Jerusalem on Thursday, the first since the Annapolis Conference on 27 November (they were supposed to meet every two weeks thereafter — or maybe the two-weeks were supposed to start only after the first post-Annapolis session of the negotiating teams, which was supposed to be held on 12 or 13 December if I am not mistaken, then one was scheduled for 23 December, but was actually held on the 24th). Palestinian officials said they were going to focus on one issue only — halting Israeli settlement activities. Haaretz reported that “Israel will not build any new [n.b., read NEW] settlements and will stop expropriating land in the West Bank, Prime Minister Ehud Olmert told Palestinian President Mahmoud Abbas during a meeting in Jerusalem on Thursday. Olmert told Abbas that Israel ‘will take no steps that will hurt our ability to arrive at final status negotiations with the Palestinians’, and added that Israel wants to carry out the negotiations ‘in good faith’.” The Haaretz report is here. YNet reported that “An informed Israeli official said that ‘the issues that have slowed down the negotiations have been neutralized’. According to sources in Jerusalem, during the two-hour meeting the leaders agreed that the sides would refrain from taking any steps that would hinder efforts to reach a permanent peace agreement, but Olmert did not guarantee Abbas that Israel would not build in Har Homa. ‘The prime minister has not promised to freeze tenders that have already been published and are already underway’, a senior Israeli official told reporters. However, officials said, the PM did reiterate his commitment not to confiscate land or set up additional settlements in the West Bank. Sources in Jerusalem told Ynet that, unlike in the past, the Palestinian demands raised during Thursday’s discussions would not stall the negotiations and would be dealt with in upcoming meetings”. The YNet report is posted here. And, the Jerusalem Post reported that “There will be no new building tenders issued for construction in West Bank settlements and the east Jerusalem neighborhood of Har Homa, Prime Minister Ehud Olmert pledged Thursday during a meeting between Israeli and Palestinian negotiating teams in Jerusalem, Army Radio reported…while the prime minister vowed that no new tenders would be issued for the east Jerusalem neighborhood, he insisted that tenders already approved could not be canceled”. The JPost report is here. Before the meeting, Haaretz reported that an official in Jerusalem said: “We want to change the direction of the negotiations … The first two meetings of the negotiating teams failed and we would want to see positive progress.” The earlier Haaretz report is here. While the Israeli press was upbeat, the international news agencies reported that the meeting appeared to have been a failure. AP reported that “Israeli Prime Minister Ehud Olmert and Palestinian President Mahmoud Abbas on Thursday held their first summit since renewing peace talks last month, but failed to resolve a dispute over planned Israeli construction in east Jerusalem. Abbas demanded at the meeting that Israel freeze its plan to expand the Jewish Har Homa neighborhood, Palestinian officials said. Abbas had appealed to U.S. Secretary of State Condoleezza Rice ahead of the meeting to pressure Israel to halt the project, Palestinian officials said. But an Israeli official said after the Olmert-Abbas meeting that Israel continued to claim a right to build in Har Homa, which lies in the eastern sector of Jerusalem that Israel captured in the 1967 Mideast war and later annexed. Palestinians claim east Jerusalem as their future capital. Palestinian negotiator Saeb Erekat said Abbas stressed the need to stop all settlement activities in order to facilitate the talks on a final peace accord, which were launched at an international conference on the Mideast in Annapolis, Md. But although he reported no progress on narrowing the gaps between the two sides, both sides described the two-hour meeting, held at Olmert’s official residence, as ‘positive’ — possibly in an effort to defuse tensions before the arrival in the region next month of President Bush. Bush is coming to the region for the first time in his seven-year tenure in a bid to build on momentum from the Annapolis conference”. The AP report is here. Reuters reported that “Israeli Prime Minister Ehud Olmert balked on Thursday at a total freeze in settlement activity, a key demand of Palestinian President Mahmoud Abbas for progress in U.S.-backed peace talks. But officials on both sides said they would continue negotiations that have bogged down since Israel announced plans to build hundreds of ew homes in an area near Jerusalem known to Israelis as Har Homa and to Palestinians as Jabal Abu Ghneim. ‘We won’t agree with the Palestinians on every issue on day one’ [day one???? ], Olmert’s spokesman, Mark Regev, said after the two-hour meeting between the leaders at Olmert’s Jerusalem residence. ‘The Palestinians have their positions. We have ours. And the commitment is to work to overcome gaps’ … While Olmert agreed not to take any steps that might prejudice the outcome of the statehood negotiations, he reiterated Israel’s position on Har Homa, Regev said. A senior Israeli official, speaking on condition of anonymity, said: ‘The prime minister has not promised to freeze tenders that have already been published and are already under way’. Israel has a different interpretation of its road map obligations, arguing that construction in built-up areas of existing settlements is permissible as long as no new settlements are built and no additional occupied lands are confiscated. During the meeting, Olmert called on the Palestinians to meet their own road map commitments to rein in militants in the West Bank and the Hamas-controlled Gaza Strip, a condition set by Israel for establishing a Palestinian state, officials said”. On Friday, the Associated Press added that “Israeli government spokesman Mark Regev said Friday that Olmert has not called off plans to build the new homes in Har Homa, and has not ordered a halt to all construction in West Bank settlements. Israel will not confiscate land for new settlement construction and will not ‘outwardly expand’ its West Bank settlements, Regev said, meaning that construction can continue inside the settlements’ existing borders. Israel also has canceled financial incentives designed to persuade Israelis to live in the West Bank, Regev said. ‘But in the Israeli perspective, the West Bank is not Jerusalem and Jerusalem is not the West Bank‘, he said.” This AP report is published here. Israeli settlement activities were discussed — but certainly not resolved — at a meeting between the Israeli and Palestinian negotiating teams on Monday. Now, Israeli Prime Minister Ehud Olmert and Palestinian President Mahmoud Abbas are scheduled to hold a “summit” meeting on Thursday on the subject, which the Palestinians have indicated must be resolved for any further progress to be made. The announcement that approval has been given for 307 – then 500 – additional homes in Har Homa, which is on a formerly-wooded hilltop between Jerusalem and Bethlehem, is only part of the picture. There has also been discussion in the press of additional building in Maale Adumim — which an Ir Amim study-tour guide said recently has jurisdiction over a larger physical area than Tel Aviv — and in Atarot, where a now-disused airport for Jerusalem sits, between Ramallah and Jerusalem, where Jewish housing is growing rapidly in several areas. In 1997, Israel announced plans to build 6500 homes in Har Homa. [N.B., so far, only about 2,500 housing units have been built — and many of them appear to be empty.] The UN Security Council met for weeks, the U.S. vetoed a draft resolution, and the UN General Assembly met in a “uniting for peace” process. Akiva Eldar wrote recently that “In the Palestinian Authority (and the Israeli peace camp) this plan was seen as another step in a scheme to cut off their capital from the West Bank. Yasser Arafat threatened to declare the establishment of an independent state and the Palestinian Legislative Council announced a general strike in the territories. That crisis was the focus of Arafat’s visit to the White House the following month. Clinton asked the Palestinian leader to be sensitive to Netanyahu’s ‘coalition pressures’. Arafat explained that he, too, had troubles at home and begged the president to at least demand that Israel delay the implementation of the decision to establish the neighborhood … On the other side were the settlers and the activists from the right. They were flanked by then-mayor [of Jerusalem] Olmert, who a short while earlier had pushed Netanyahu into the Western Wall tunnel – an adventure that ended with the death of 16 Israeli soldiers and dozens of Palestinians. Olmert declared that Har Homa was ‘the most substantive test of the government’s ability to withstand pressure and demonstrate leadership’ … The response today of spokesmen for the Olmert government gives rise to the fear that the Annapolis conference did not change the situation on the Israeli side. They claim that ‘the neighborhood is within the area of the municipal boundaries of Jerusalem, over which Israeli law is binding, and therefore there is no prohibition to building there, just as there is no obstacle to building in any other part of Israel’. We have already forgotten that the prime minister agreed that everything would be open to negotiation, including Jerusalem. Is this the way to build a wall to fortify the status of PA President Mahmoud Abbas? And what will ‘the world’ do – all those people who were in attendance at Annapolis – if Olmert decides to hide behind ‘pressures from the coalition’ and approves the new construction?” Akiva Eldar’s analysis in Haaretz is here. Haaretz says that a “summit” between Israeli Prime Minister Ehud Olmert and Palestinian President Mahmoud Abbas to discuss Israeli settlement activities will be held on Thursday 27 December. Haaretz reports that “Official sources in Jerusalem say the Har Homa imbroglio is the result of a decision by low-ranking government bureaucrats in the Housing Ministry. They say that Olmert was not informed of the decision in advance, but on the international front, these explanations do not seem to be enlisting much support. Moreover, the Har Homa affair exposed the differences in the perceptions that both parties adhere to. As far as Israel is concerned, the neighborhood is an integral part of unified Jerusalem, and not part of the territories. Construction at Har Homa is not subject to the same bureaucratic maze that any construction in the territories – be it a house, shack or electricity line – must endure before it is approved. The Palestinians and their supporters in the international community do not make that distinction. To them, any Israeli construction east of the Green Line, which was Israel’s border before the 1967 Six-Day War, is an illegal settlement. They treat construction in East Jerusalem much the same as they treat construction in the settlement blocs in the West Bank. To the Palestinians, construction in the territories is an obstacle to peace and an act that jeopardizes the negotiations. In addition, the Palestinians realize that Israel – which is expecting its first visit by U.S. President George W. Bush next month – is at a disadvantage internationally as far as settlements are concerned. Their objective is to dominate the headlines until Bush arrives. But the problem goes deeper than head-butting in the media. Israel has demanded that the Palestinians fulfill their duties according to the road map plan for peace, which the U.S. devised for both parties. But Israel has failed to meet its own obligations such as the evacuation of settlements, a total freeze on all construction in the territories and allowing the Palestinians to reopen their institutions in East Jerusalem”… The Haaretz report on Thursday’s Abbas-Olmert “summit” is here. Israeli human rights groups say they have submitted a new petition to the Israeli High Court to stop the state from instituting a second phase of even deeper fuel cuts to Gaza starting next Sunday. Up to 43% of the amount of gasoline (or petrol) ordered by Palestinians in October will be withheld, starting next Sunday. On 28 October, the Israeli Defense Ministry began fuel cuts. On 2 December, fuel supplies to Gaza were supposed to be reduced by a further 15%, but the amounts of cuts of different types of fuel have reportedly varied. Now, in a press release distributed on Christmas evening, the Israeli organization GISHA said that “the state announced that it would deepen the cut in gasoline (petrol) to Gaza, beginning Sunday, December 30, to up to 43% of the amount provided before the cuts. Yesterday, Gisha and Adalah asked the court for a preliminary injunction against this further cut, but no decision has yet been given. The two organizations said that “The fuel cuts, which began in October, have already caused severe damage to vital institutions in Gaza”. However, Gisha noted, “the state said yesterday that it would temporarily restore diesel supplies to Gaza, which had also been cut. The cuts in the various types of fuel have paralyzed some operations in hospitals and clinics and deprived tens of thousands of people of access to clean water. Garbage has been piling up in the streets, because there is no gas for sanitation trucks … which controls Gaza ‘ s borders, sells fuel and electricity to Gaza and does not allow fuel to be imported any other way”. Ramattan News Agency is reporting today that the talks between the Israeli and Palestinian negotiating teams on Christmas eve were “difficult”. Ramattan says that Chief Palestinian negotiator, Saeb Erekat, “said in an interview with RNA on Monday night, that the two delegations discussed nothing but the issue of the Israeli settlements in Jerusalem and the West Bank”. Erekat said that the Palestinians insisted that all settlement activity must stop, while the Israeli delegates mentioned “security issues”. Erekat said that the two negotiating teams would not meet again until after a “summit” meeting on Tuesday (today? or next Tuesday? where? in Bethlehem? in Jerusalem?) between Palestinian President Mahmoud Abbas and Israeli Prime Minister Ehud Olmert. The Ramattan News Agency report is published here. UPDATE: Haaretz says on Wednesday 26 December that the “summit” will be held on Thursday 27 December. Haaretz reports that “Official sources in Jerusalem say the Har Homa imbroglio is the result of a decision by low-ranking government bureaucrats in the Housing Ministry. They say that Olmert was not informed of the decision in advance, but on the international front, these explanations do not seem to be enlisting much support. Moreover, the Har Homa affair exposed the differences in the perceptions that both parties adhere to. As far as Israel is concerned, the neighborhood is an integral part of unified Jerusalem, and not part of the territories. Construction at Har Homa is not subject to the same bureaucratic maze that any construction in the territories – be it a house, shack or electricity line – must endure before it is approved. The Palestinians and their supporters in the international community do not make that distinction. To them, any Israeli construction east of the Green Line, which was Israel’s border before the 1967 Six-Day War, is an illegal settlement. They treat construction in East Jerusalem much the same as they treat construction in the settlement blocs in the West Bank. To the Palestinians, construction in the territories is an obstacle to peace and an act that jeopardizes the negotiations. In addition, the Palestinians realize that Israel – which is expecting its first visit by U.S. President George W. Bush next month – is at a disadvantage internationally as far as settlements are concerned. Their objective is to dominate the headlines until Bush arrives. But the problem goes deeper than head-butting in the media. Israel has demanded that the Palestinians fulfill their duties according to the road map plan for peace, which the U.S. devised for both parties. But Israel has failed to meet its own obligations such as the evacuation of settlements, a total freeze on all construction in the territories and allowing the Palestinians to reopen their institutions in East Jerusalem”… The Haaretz report on Thursday’s Abbas-Olmert “summit” is here. Haaretz has published Christmas Greetings from Michel Sabbagh, the Latin (Roman Catholic) Patriarch not only of Jerusalem and Palestine, but also of nearly the whole region, who shocked Israel just a few days ago with his (subsequently strongly-criticized) remarks taking issue with the Israeli demand for recognition as a Jewish State. In his Christmas message, “Let there be peace“, Sabbagh did not back down from his criticism of the Israeli position — though he chose his words carefully. “We joyfully celebrate Christmas, hoping to see better days in our Holy Land, by the grace of God, by our own contribution to bring peace to this land and by sharing in all the sacrifices that it requires. For this reason, at Christmas, we renew our faith in the One in whom we have believed, the Word of God made man, Jesus born in Bethlehem, the Prince of Peace, and the Savior of humankind. He became man in order to bring us back to God our Creator and to let us know that we are not alone, that we are not abandoned to ourselves as we face the numerous challenges of this Holy Land. Because God is with us, we remain hopeful in the midst of all the daily difficulties we experience as a result of the occupation and of the insecurity and deprivations that arise from it. God is with us, reminding us that the commandment of love, which was given to us by Jesus, born in Bethlehem, still remains valid for the difficult times in which we are living today: our love for one another and for every man and woman. This love consists in seeing the image of God in every human being, of every religion and nationality. It is a love that knows how to forgive and, at the same time, to demand all our rights, especially those given by God to each person and to the entire community, such as the gift of life, of dignity, of freedom, and of the land. A love that requires from every one to care for one another. A love that is dedication and sharing with all who suffer from deprivation and poverty so that the same life, which God has given to all of us, may be lived to the fullest, namely, the ‘abundant life’ that Jesus came to give us. Michel Sabbagh’s Christmas message was published in Haaretz today here. Ma’an News Agency reported from Bethlehem on Christmas Eve that “Latin Patriarch Michel Sabbah is scheduled to arrive to Bethlehem coming from Jerusalem in the afternoon. He will preside over the midnight Mass in the Church of Saint Catherine within the Nativity Church’s compound. Archbishops Fuad Tiwal and Kamal Bathish and other Latin clerics and dignitaries will partake in the midnight Mass along with Palestinian officials.” The Ma’an report is published here. Reuters and Haaretz are reporting that “Palestinian President Mahmoud Abbas told pilgrims in Bethlehem on Christmas Eve that ‘the new year, God willing, will be a year of security and economic stability … We pray next year will be the year of independence for the Palestinian people’, Abbas continued … Christmas carols played through a packed Manger Square ahead of the traditional midnight mass, though the majority of those gathered were Palestinians and not the foreign tourists local vendors were hoping for … Tourism, the lifeblood of Bethlehem’s economy, has improved as Western powers have sought to bolster Abbas in his power struggle with Hamas Islamists who took over the Gaza Strip in June .. But local leaders remain cautious; tourism numbers still hover at just 60-70 percent of pre-Intifada levels, and many Western governments still warn against non-essential travel … Ahead of the festivities, Palestinian security forces, many carrying newly issued rifles, took up positions on the streets of Bethlehem in numbers not seen in years”… These details were published here. Earlier, Haaretz had reported, with some reliance on Reuters, that “Five hundred new security officers moved into Bethlehem on Sunday to beef up a force of about 1,000 men already based in the city, a Palestinian security source told Reuters. It was the third such deployment since November by hundreds of officers loyal to Palestinian President Mahmoud Abbas in the occupied West Bank, where his forces have already taken control in the cities of Nablus and Tul Karm”. This report was carried by Haaretz here. The Independent reported that “Tony Blair, now the international Middle East envoy, who last week called for more visitors to help the Palestinian economy and declared before spending a night last week in the city’s Intercontinental Hotel: “Bethlehem is safe and a great place to visit. Everyone who can should share the experience.” But Mr Blair, who is trying to promote tourism in Bethlehem as one of his four “Quick Impact Projects” to create some jobs, went a little further. He added that “it would be a great place if the context was different“, and went on to depict Bethlehem as a litmus test for Israel’s commitment to peace. “The real test of the sincerity of the Israeli side is if we really get change here in Bethlehem.” Partly thanks to Mr Blair’s efforts, this Christmas, at least, already looks like being significantly better than last year’s. The Israeli Tourism Ministry, preparing for 60,000 Christian pilgrims to the Holy Land compared with 40,000 last year, has assigned extra staff at the main crossings into Israel and the Jordan Valley to ensure ‘pleasant and quick passage’ for Christian visitors”… This report was published here. On Christmas eve, The Independent reported that “After seven lean, intifada years, Joseph Canavati, owner of the modern Alexander Hotel on Manger Street, the snaking main road leading to the Church of the Nativity, is dusting off his ‘No vacancies’ sign. The pilgrims are coming back. ‘This is the best year we’ve had since the uprising’, he beamed. ‘There are peace talks. There’s no violence in the Bethlehem area, no violence in Jerusalem. Our business depends on tranquillity. If there is no violence, there is business’. The guests for his 44 rooms come from the United States, Italy, Lithuania, and South Korea. All 2,000 beds in Bethlehem hotels and hostels are booked for Christmas for the first time since 2000. Victor Batarseh, the West Bank city’s Roman Catholic mayor, expects 40,000 pilgrims to visit Jesus’s birthplace for the holiday. Despite the bleak welcome of Israel’s concrete security wall at the entrance to the city, there is renewed buoyancy in the streets: more coloured lights and decorated trees, few if any political slogans or portraits of Chairman Arafat. The roads, once ravaged by Israeli shells and armoured vehicles, are swept and repaired”… This report in The Independent can be seen here. By the middle of Christmas day, the tourist rush was over, and the inflated numbers were coming down. The Associated Press reported that “Vendors mingling with the crowd in Manger Square hawked rosaries, handcrafted bags, popcorn, steamed corn and Turkish coffee. ccording to Israeli border police, who monitored the entry of visitors into Bethlehem, 22,000 tourists had crossed over by midday, including about 7,000 Israeli Arabs”… This AP report is here. 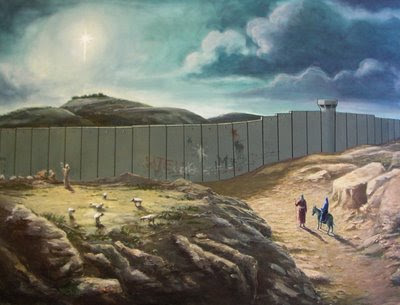 Dunno where he got it — or if he did it himself — but this very effective image is taken from the Palestinian Pundit blog, showing The (present-day) Wall (with biblical figures) near the town of Bethlehem. The Independent reported a few days ago that “Part of the barrier’s purpose is to close off Bethlehem from Jerusalem as well as the much closer Gilo and Har Homa. Both are officially regarded by the international community as settlements in occupied territory and by Israel as Jewish neighbourhoods in land it unilaterally annexed after the Six Day war. And both are now on the ‘Israeli’ side of the barrier. It was Israel’s plan to build 300 new homes at Har Homa, known to generations of Arabs as Abu Ghneim, which soured the first negotiations to follow last month’s Annapolis summit”… The Independent story on Bethlehem is published here. On Sunday (23 December), news reports indicated that even more new homes are budgeted for Har Homa this year. AP reported that “Israel’s diplomatic efforts to reach a peace deal with Abbas were hurt Sunday with the disclosure that Israel plans to build an additional 740 apartments in disputed east Jerusalem and the West Bank in 2008. Palestinians claim east Jerusalem and the West Bank, areas captured by Israel in the 1967 Mideast war, as part of their future state. Some 450,000 Israelis live in these areas, and the timing of Sunday’s announcement was sensitive. The two sides formally renewed peace talks after a seven-year break less than one month ago, and President Bush is expected to visit the region next month. Rafi Eitan, Israel’s minister for Jerusalem Affairs, confirmed the Construction Ministry’s proposed budget for 2008 includes 500 new apartments for the Har Homa neighborhood in east Jerusalem, and 240 new apartments in Maaleh Adumim, a major West Bank settlement just outside Jerusalem. Eitan told Army Radio that Israel never promised to halt construction within the municipal borders of Jerusalem, whose eastern sector Israel annexed after capturing in the 1967 Mideast war. Eitan called both areas ‘integral’ parts of Jerusalem. Olmert spokesman Mark Regev said he was ‘not aware’ of the plan to expand Har Homa and said there was ‘no new decision’ for additional construction in Maaleh Adumim. The international community never recognized Israeli sovereignty over east Jerusalem … Eitan’s comments were the third announcement in recent weeks of plans to build in east Jerusalem and the West Bank”. The AP report is published here. Haaretz is reporting that “Israeli security officials said they were permitting 400 Gaza Christians to travel through Israel to Bethlehem for Christmas”. The Haaretz report is here.